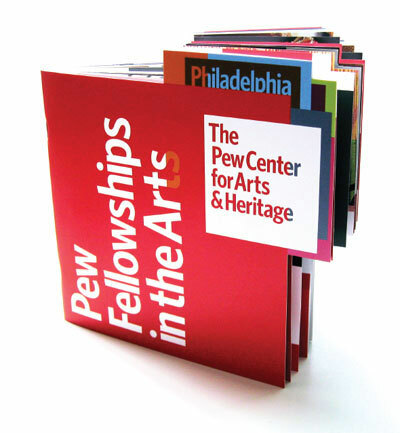 Late last year we finished the first phases of a major rebrand for the Pew Center for Arts & Heritage in Philadelphia. They approached us in 2008 to help them re-organise themselves under a new name, whilst finding a way to recognise the various initiatives that were being brought together. Although they wanted at one level to present themselves as a unified ‘Pew Center’, they still wanted to show that they worked across dance, exhibitions, arts fellowships, theatre, management, heritage and music, all within the Philadelphia area. And they wanted to let their initiatives sometimes still use their current names. What you might describe as a tricky brief. After a lengthy design process, we started thinking of the centre and its constituent parts a little like ‘cards’ that we could shuffle and reorganize – the part you wanted to represent was simply the one ‘on top’. But, crucially, we allowed glimpses of the other initiatives to peek out behind the main card.